In his first television interview since leaving public service in 2006, former Defense Secretary Donald Rumsfeld gives candid criticism of his fellow Bush administration officials, former Secretary of States Colin Powell and Condoleezza Rice. He also expresses his disappointment in former President George H.W. Bush. Powell, President George W. Bush's first secretary of state, "did not, in my view, do a good job of managing the people under him," Rumsfeld said in an interview with ABC, set to air this week. "There was a lot of leaking out of the State Department, and the president knew it," he reportedly said. "And it was unhelpful. And most of it ended up making the State Department look good. We didn't do that in the Pentagon. I insisted we not do it." Rumsfeld was criticized during his tenure as defense secretary for his tight rein on information relating to the war on terrorism. This week, in conjunction with the release of his new memoir "Known and Unknown," Rumsfeld is releasing online nearly 2,000 documents from his career in public service. They span his time in Congress, in the Ford and Nixon administrations, the 9/11 attacks and the build up to the Iraq war. 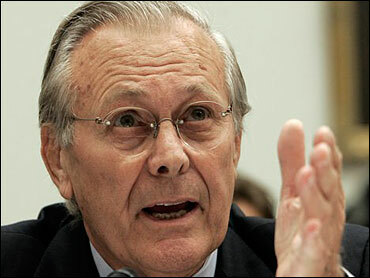 Rumsfeld acknowledged that "the intelligence was certainly wrong" with respect to weapons of mass destruction in Iraq. However, he said that the military and the Bush administration -- including Powell -- had faith in the intelligence at the time. "There's a lot of stuff [in] the press that say Colin Powell was against [the war]," he said. "But I never saw even the slightest hint of that." "The idea that he was lying or duped is nonsense," Rumsfeld added. Rumsfeld said "it's possible" that decisions on troop levels in Iraq may have been the biggest mistake of the war. He maintained that the war overall was not a mistake. "I think the world's a better place with Saddam Hussein gone and with the Taliban gone and the al Qaeda out of Afghanistan," he said. Rumsfeld was also critical of Powell's successor, Condoleezza Rice, for her lack of experience in government. "She'd never served in a senior administration position," he said. "She'd been an academic. And, you know, a lot of academics like to have meetings. And they like to bridge differences and get people all to be happy." Rumsfeld said he was "amazed" he was ever asked to join the George W. Bush administration, given his at times contentious relationship with former President George H.W. Bush. "I was kind of disappointed in him," he said of the elder Bush. "He decided he wanted to leave people with the impression that he didn't want to go to the CIA [in the Ford administration]. And that someone made him go there. And it was probably Rumsfeld or something."